This year Campaign for Nuclear Disarmament (CND) is working with Campaign Against Arms Trade (CAAT) and Trident Ploughshares to organise a ‘No to Nuclear’ day at the DSEI arms fair in London. Matt Fawcett from Yorkshire CND explains. The Defence & Security Equipment International (DSEI) is the world’s largest arms fair, held in London every two years. The fair is heavily sponsored by the UK government to promote arms sales abroad and each year hosts representatives from countries with grave human rights records. In successive years the fair has been found to be selling weapons that are banned in the UK (such as electroshock, torture equipment and cluster bombs) but of particular interest to us is the vast array of nuclear weapons companies attending. The exhibitor list this year includes those responsible for every link of the nuclear chain from nuclear test sites and fuel rod production to the delivery and guidance systems for land, sea and air based nuclear weapons systems. The companies attending the arms fair include BAE Systems (who build the Trident submarines) and Lockheed Martin (who build the warheads). Our plan is to disrupt the fair to show that it’s not acceptable that companies building a new nuclear weapons system are welcomed by the government. The ‘No to Nuclear‘ day will take place on Wednesday 6th September, following the ‘Stop Arming Israel‘ and ‘No Faith in War‘ events on the Monday and Tuesday respectively. We need as many people as possible to come along on the day to make sure we get the no to nuclear message across. There will be speakers, creative stunts and food alongside non-violent direct action to stop deliveries of weapons to the exhibition centre, ExCel London. London CND members and other southern CND groups are asked to join Trident Ploughshares on the western entrance of the ExCel London near to Custom House station (note that this station is currently closed for redevelopment but if you are arriving by the Docklands Light Railway you can use Royal Victoria). Northern CND groups will be joining ‘Arms to Renewables‘ on the eastern entrance by Prince Regent station, where we’ll be transforming our model Trident missiles into wind turbines! Youth and Student CND will also be present. Transport has been arranged by CND groups in Leeds, Bradford, Sheffield and Manchester and there will be limited accommodation for those travelling from afar. For more info on this please contact info(at)yorkshirecnd*org*uk. Come along to protest against those companies who profit from Trident replacement and so help create a more dangerous and unpredictable world. 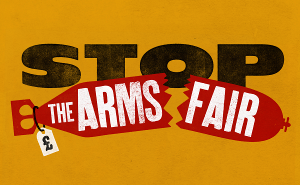 Contact nonuclearday(at)riseup*net with any questions about the arms fair action. This article was originally published in the August 2017 edition of Campaign, the magazine of the Campaign for Nuclear Disarmament. Reproduced with kind permission.